Stacey Moore’s ‘Every Horse Remembered’ artwork raises £1200, for Brooke Horse Charity. Friday 2nd November saw two talented animal-loving entrepreneurs join forces to raise funds for Brookes ‘Every Horse Remembered’ campaign marking 100-years since the end of the First World War. Artist Stacey Moore, known for her stunning drawings of Dales wildlife and Leyburn-based Hannah Russell, who writes books about her miniature Shetland pony Little Alf, joined together and created a commemorative piece of artwork which was put up for auction at the Brooke Gala Dinner this Friday. The event, at Headlam Hall in Darlington, attracted an audience of around 100 people, including OBE Alastair Stewart and chief executive Petra Ingram. A grand auction, conducted by Alastair Stewart OBE, included the “Every Horse Remembered” artwork by Ms Moore and the original was sold to an anonymous bidder for £1200 in the auction. The money will go towards the Brookes “Every Horse Remembered” campaign, marking the centenary of the outbreak of the First World War remembering the lives lost. Hawes-born artist Stacey Moore, who was a guest, at the ball said: "It was an honour to be asked to be involved and I'm very happy that it raised valuable funds for such a fantastic charity." Caroline Robertson, Senior Regional Fundraising officer, said: "It was an unforgettable occasion and everyone at Brooke is thrilled that 'Every Horse Remembered' raised such a lot of money." Yorkshire artist Stacey Moore and best-selling author Hannah Russell Link up to support Brooke, Action for working horses AND donkeys. The original drawing will be auctioned at the annual Brooke Gala Dinner this November by Alastair Stewart OBE and 100% of the proceeds will go to Brooke. There are also 500 Limited Edition prints and 5 Special Edition prints hand embellished with 24 carat gold leaf available now, with 5% from every sale being donated to Brooke. "Stacey Moore is an extremely talented artist, and the drawing of Little Alf is too cute for words! Brooke is delighted to have been chosen as the benefitting charity of this amazing drawing, to receive the proceeds from the auction of the original plus 5% of all special and limited editions prints. We are extremely grateful to Hannah, Stacey and Little Alf for their very kind and generous donation. This support will help Brooke reach many more hardworking horses, donkeys and mules and the people that depend on them for their livelihood in some of the world’s poorest communities." The original drawing will be auctioned at the annual Brooke Gala Dinner by Alastair Stewart OBE, 100% of the proceeds will go to Brooke. Get in touch for more information. 5 Special Edition Prints have been released. These are hand embellished by the artist with 24 carat gold leaf, 5% of the proceeds will go to Brooke. Framed size 18inch x 22inch, price £500 Buy now. 500 Limited Edition Prints have been released. These either come mounted (12inch x 16inch £95) or framed (14inch x 18inch £120) in the choice of oak or white. 5% of the proceeds will go to Brooke. Buy now. 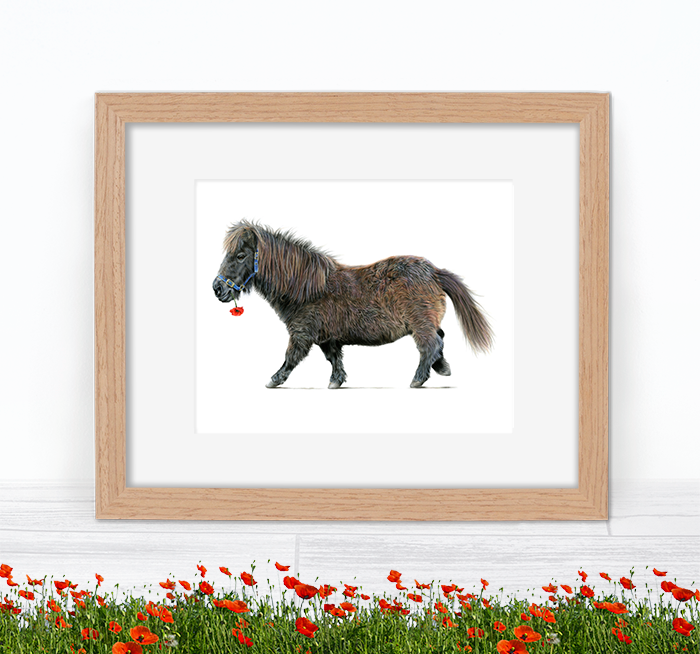 ​Hannah is most known for writing books about her miniature Shetland Little Alf who has rose to international fame over the past few years, winning awards for their books in the US, New York and here in the UK. 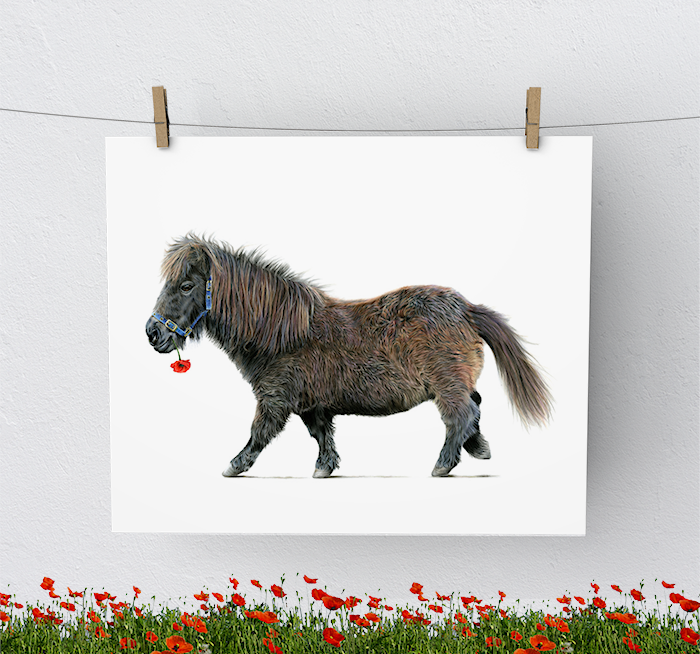 Little Alf has become quite the celebrity Shetland pony. In 2018 Hannah and Little Alf where announced as ‘Brooke Every horse remembered’ ambassadors, a campaign launched by the charity to remember the eight million horses, donkeys and mules which died in World War 1.